From Page2Pixel» Blog Archive » DVDs to last for millennia? Perhaps, but at a cost. DVDs to last for millennia? Perhaps, but at a cost. As I’ve mentioned in some of my previous articles, I’m incredibly skeptical of the long-term success of any digital storage attempt that relies on a single medium as its container. 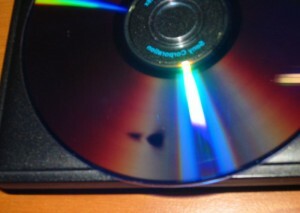 In particular, I find CDs and DVDs to be extremely suspect in terms of their longevity. Those of us who have been around the block with these technologies know that Gold CDs and DVDs were supposed to be the last word on digital preservation, lasting decades if not centuries. But mere years later, we all learned a new term to add to our archival vocabulary: Disc Rot. It became very clear to all of us that not all discs – not even the gold ones – are made equal, and some even from “trusted” brands can delaminate, fade, have their media layers flake off, or otherwise deteriorate and become unreadable in rather short periods of time… sometimes with painfully devastating results for smaller archives who banked it all on CDs and DVDs. As a result, a type of storage medium that we were told would last decades has been widely recognized as only being good for about two to five years. So clearly, it’s not without some deep suspicion and trepidation that I view a recent announcement by an unknown start-up known as Cranberry, in which they claim to solve the Disc Rot problem, and has introduced a type of DVD that they say will last 1,000 years. A Cranberry DiamonDisc is a DVD made of high tech stone. Memories carved on a DiamonDisc will last as long as the pyramids. No reflective surface. No ink layer. No fading. Problem solved. The Library of Congress is studying our technology for storage of the national archives. It’s the only solution for permanent, digital storage. This is a pretty bold claim from a company that no one has heard from until recently. But what hard evidence does Cranberry have to – forgive the pun – back it up with? How can you prove that the Cranberry Disc will last for centuries? No one can prove that anything will last for centuries, but there are international standards for estimating the archival lifetime of optical media. The ECMA‐379 (2nd edition, December 2008) which tests the effects of temperature and relative humidity is widely recognized. Researchers at Millenniata have tested the Cranberry Disc using the ECMA‐379 temperature and humidity (85°C / 85% RH) testing as a standard to develop the most rigorous testing possible. They have combined temperature and humidity (85°C / 85% RH) tests with exposure to the full‐spectrum of natural light. The Cranberry Disc is the only survivor after this rigorous testing. Considering the combination of the Cranberry Disc’s test results and its rock‐like data layer, it is reasonable to conclude that the Cranberry Disc has a greater longevity and durability than competitors who claim a 300‐year shelf life. Millenniata is the sole provider of a permanent, backwards-compatible archiving solution for the digital age. Located in Springville, Utah, Millenniata is poised to become the world’s leader in digital data preservation. Millenniata is the result of pioneering inventions from Brigham Young University. So… what’s going on here exactly? It’s difficult for me to accept that Cranberry claims to have cornered the market in creating DVDs that last a millenium, only to point to research done by a company that claims it holds the sole solution to the disc rot problem. Both companies claim that their respective formats are not something that the mundane DVD burners on standard computer equipment can burn. Cranberry claims the needed equipment to make a DiamonDisc is “out of the reach of most consumers,” and it wants you to send your data to them so that they can “etch” a DVD for you, at a cost between $29.99 to $34.95. Millenniata, however, will gladly sell you the special burner required to author these discs, which according to some news sources will cost up to $5,000 for the drive and a pack of 10 discs. Once created though, both products will purportedly read just fine on any DVD drive. The capacity of these discs are 4.7GB, the same as a single layer DVD-R.
My as-yet-unconfirmed speculation is that, based on the descriptions both entities provide for their products, the storage products both companies offer might actually be one and the same. If that’s true, then I’d have to conclude that the research done on these discs’ longevity is hardly objective and unbiased. So, should archivists invest money in these discs? My philosophy has always been that you should never blindly trust a vendor’s claim about how long their storage media should last, nor should you trust a single storage solution for archiving your digital content. If a curator wants to spend multiple thousands of dollars for an M*ARC drive, or spend $30-$35 for Cranberry to author each disc, that’s their decision, but it should be supplemented by a secondary solution, be that hard drives, tape, solid-state media, or some other well-known container format. And that data needs to be checked periodically to verify its integrity. Cranberry claims that the Library of Congress is studying the technology for its own archival use. Personally speaking, I would like to see the definitive results of such a study, before I would feel comfortable making a decision on whether M*ARC or DiamondDiscs are worth the premium. And even then, I still would not back away from my two-format philosophy to long-term digital storage. It’s ironic that Cranberry is hyping up NARA and LoC studies, citing them as reasons why you should be very,very afraid about storing your precious data on standard writeable disc media. Let’s hope for their sake that the LoC verifies their claims are true, or else their marketing literature would prove pretty embarrassing.